How fast can a quadcopter fly? Racing drones are becoming more and more popular, and it would not only be interesting to know, how fast they can really go, but also which parameters have a major impact on their maximum speed. When I searched in the net, I couldn’t find clear answers and had to work out something by myself; so here is my model. To be clear, my intention is not to get absolute precise numbers, but more to understand the physics behind, and to have a tool to get realistic estimates and comparisons of flight parameters for different quadcopter models. If you are not interested in the details, just scroll down to the end of the page, where I show the final formulas and some calculated examples. Thrust is defined as a force and measured in Newton. 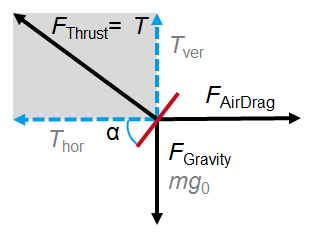 In datasheets motor thrust is usually shown as pull P in gram for selected propeller types, therefore it has to be multiplied by gravity: T = P * g0. The factor with the square root in (3b) reflects the fact that a certain fraction of the thrust is needed to keep the quadcopter at constant altitude. The vertical component of the motor thrust has to compensate the gravitational force mg0. The copter flies with a forward pitch angel α. The thrust ratio has to be greater than 1. Beside the thrust ratio, the maximum climbing rate is a function of the weight (m) and the size (area A) of the quadcopter, as well as the aerodynamic drag coefficient cD. For practical thrust ratios around 2 or higher the factor under the double square root is close to 1. As for the maximum rate of climb, the maximum forward flight speed depends on the weight, size and aerodynamic form of the quadcopter, but the main factor is the thrust over weight ratio. An increase will directly translate into an increase in forward speed. For a 250 racing quad (MTM = 0,255 m) of 560 g weight (455 g net + 105 g battery, m = 0.56 kg) with 2204-2300kv motor and 5 inch propeller (r = 0.0635 m), pull is specified as 310 g, resulting in a thrust ratio of TR = 2. We calculate a maximum flight speed of 18.5 m/s (67 km/h) and a maximum climbing rate of 10 m/s. Changing the propeller to 6 inch will increase pull to 440 g, resulting in a thrust ratio of 2.8. The speed will increase to 24.5 m/s (88 km/h). I have built a mini quadcopter with 4 inch propeller and 180 mm MTM. Net weight is 245 g, total weight with 1.3 Ah battery is 365 g. The thrust ratio is 2.17 resulting in a maximum speed of 22 m/s (78 km/h). This mini quadcopter will be faster than the racing quad with 5 inch propellers. For the DJI Phantom 2 Vision+ MTM is 0.35 m, weight is 1.24 kg and propeller size 9 inch. With a thrust ratio of 1.9 we calculate a maximum flight speed of 17 m/s (61 km/h) and a maximum climbing rate of 9 m/s. 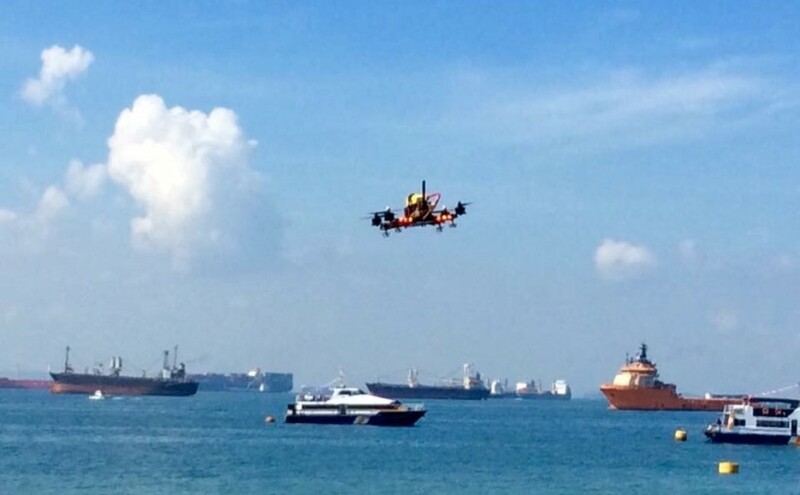 The specification of the Phantom shows 15 m/s maximum speed and 6 m/s rate of climb. Practical tests show an actual climbing rate of 8 m/s. Though the model is rough with simplifications, it seems to give some realistic numbers. The result is not surprising: for a given model the major factors to increase speed are reducing weight (lighter battery), increasing thrust (change of propellers) or improving aerodynamics (reducing the drag coefficient). The parameters with the highest uncertainty in the calculation are the actual effective area and the drag coefficient (Aeff cD). It would be interesting to get some actual measured values.